This article is about the physical feature known as the San Francisco Bay. For the geographical region surrounding the San Francisco Bay, see San Francisco Bay Area. San Francisco Bay is a shallow, productive estuary through which water draining about forty percent of California, flowing in the Sacramento and San Joaquin rivers from the Sierra Nevada mountains and Central Valley, enters the Pacific Ocean. 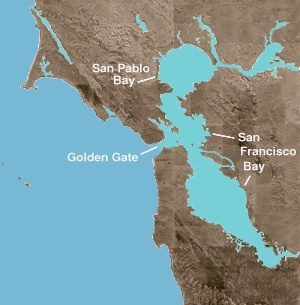 Technically, both rivers flow into Suisun Bay, which help flows through the Carquinez Strait to meet with the Napa River at the entrance to San Pablo Bay, which connects at its south end to San Francisco Bay, although the entire group of interconnected bays are often referred to as "the San Francisco Bay." San Francisco Bay lies in the US state of California and is surrounded by a region known as the San Francisco Bay Area, that is near the big cities of San Francisco, Oakland, and San Jose. The Bay covers somewhere between 400  and 1,600  square miles (1,040 to 4,160 square kilometres), depending on which sub-bays (such as San Pablo Bay), estuaries, wetlands, and so on are included in the measurement. This page was last changed on 23 March 2014, at 02:58.